The following photos are scanned from a July 22, 1998 edition of the British newspaper, The Express, sent to me by my good friend Rob over in Manchester. "I was living here when I met John Lennon and it was here that I rehearsed with the Beatles..."We wrote Love Me Do and I Saw Her Standing There in the parlour. I was still living in the house when The Beatles found worldwide fame, so my memories are closely connected with those times. My mum and dad would now find it very hard to believe that their house is now a National Trust property. But they would be chuffed about it..and so am I." This is a picture taken from Dezo Hoffmann's book, With The Beatles in that very same house. . I'll help with the dishes next, Paul! Here is another favorite of mine, from Mike McCartney's book, Remember. 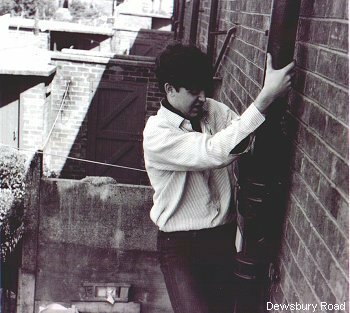 Paul used to sneak in late and climb up the drainpipe and hope to miss the toilet when he slid through the window.